Introducing Zen Air Immune Boost Diffuser Blend of Essential Oils, Joining the Popular Topical Blend from Sublime Naturals for Wellness. This duo is an ideal gift or self-gift to support the immune system for better health and strength. The therapeutic blend is made up of Eucalyptus, Oregano, Cinnamon, Clove, Rosemary, Lemon, Peppermint, Frankincense, Rosemary - Cinnamon & Clove are the dominant scents. The New ZEN AIR IMMUNE BOOST Diffuser Blend of Essential Oils Joins the Topical Blend, Sold Together in a Gift Bag, from Sublime Naturals. 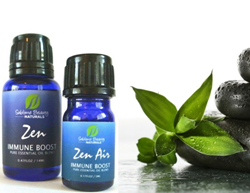 Sublime Naturals has introduced a new essential oil blend: Zen Air Immune Boost. "Our topical Zen Immune Boost essential oil blend is very popular. It is mixed in organic jojoba and sunflower to be applied to the skin. I wanted to offer the same delicious and powerful blend for the diffuser or inhaler - without carrier oils," says Kathy Heshelow, founder of Sublime Naturals and author of "Essential Oils Have Super Powers.". The Zen Air Immune Boost Diffuser Blend is offered together with the Zen Immune Boost topical blend now, in a gift bag. It is available for purchase now. The blend is similar to one from medieval France that repelled the "Black Death" by those who used it, says Heshelow, who lived in France for 16 years. It includes pure Eucalyptus, Oregano, Cinnamon, Clove, Rosemary, Lemon, Peppermint, Frankincense and Rosemary. Place 2-5 drops in a diffuser (depending on the size of diffuser and room). It will help purify the air of bacteria, smell wonderful and offer immune and lymphatic system support. The topical blend can be used once or twice daily (recommended at bedtime). Sublime Naturals introduces new therapeutic-grade essential oils each month on its store, and also sponsors Zen Box, a subscription box of essential oils. Heshelow says, "Starting in 2017, Zen Box will be offered every other month instead of monthly along with education, free shipping, control of account and secret discounts and bonuses." Pick up the new Immune Boost duo now, offered in an organza bag - ideal for a gift or self-gift.